These lost wax fine art bronze reproductions are made entirely in the USA and are cast directly from the original terracotta sculptures of artist Natalie Levin. They are available in 2 sizes, their initial large size and also as smaller versions at 1/4 scale. May you treasure their intricate detail and powerful presence. “Murti" in Hinduism refers to a form or statue in which the Divine Spirit is expressed. 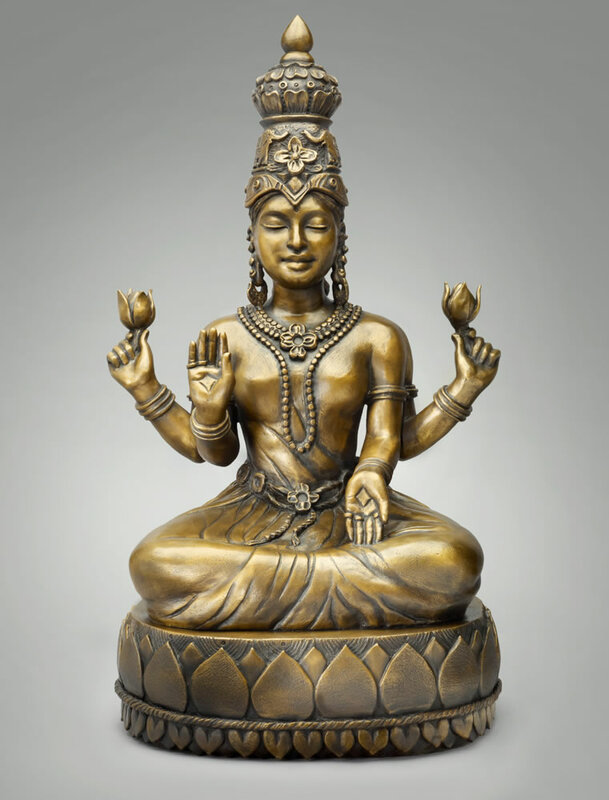 Learn more about the Shakti goddesses. All Nataji® Bronzes are carefully packed in custom wooden crates which are made especially for each sculpture. Each crate is usually shipped insured using Fedex ground, we can also ship expedited on request. We also ship Internationally. Customer pays for all freight charges and the custom crating/packing, fees which are calculated separate to the sculpture price. A well crafted bronze sculpture will last practically forever with very little maintenance. It is important to know, however, that because of its high copper content, bronze will naturally oxidize and the patina colors will change over time, especially if it is kept outdoors. Natural oils from your hands, sunlight, pollution, moisture, and even time itself will cause changes in the color of the bronze. 1. Dust the pieces monthly with a dry cloth. 2. Every 3-6 months wax the pieces with Johnson’s Paste Wax, Renaissance Wax or a comparable carnauba wax. Rub the wax into the sculpture with a soft cloth, then let wax dry a bit before removing the wax with a soft polishing cloth. 3. If you would like the sculpture to shine, you can use a bit of coconut oil (or other natural oil) on a soft cotton cloth to wipe down the bronze and bring out the luster.